Emiel De Baere: Who is he? When I read Solid's vacancy, I knew immediately that this was for me. To begin with, I have always worked in the part of the clothing industry that strives for profit. There is little wrong with that, but on the other hand, we all know that the clothing industry tends to be capitalism "at its purest". It all depends how you chose your purpose. İt’s a slow turning in life to know that to be of service to others is the most fulfilling life of all. After eight years working for a large chain clothing company as an international buyer and as a young man; with it’s retail in 4 countries, and having seen a lot of production in the Far East, I decided not to go further in this nicely pre-planned career. A great job, but this was often too much in my face of what I was doing. This is a slow process when success is not in line with who you really are. So, then I changed sides and worked from behind the curtain for a while until I became a visible partner in a Turkish production company. The final plan - of everything I had learned in 8 years at We International - was not to produce for the large chain companies, but rather in the niche of smaller brand names and designers. The strategy was a great success, but took some time to get there. We paid our employees in Turkey far above the sector average because we had the right product and gave meticulous service to our customers. There also developed an increasingly social role for me in the company. Twenty or so years ago, Turkey was and still is a difficult country to be a worker. I inspired profit sharing for our employees and played a protective and emancipative role within my team. I was in the board of directors all at the same time. This social part was not always an easy task. After this experience, I continued to work with the same model and with different companies in Turkey, while also following the developments in the European retail sector and working on the evolution “branding”. Solid is a challenge with a whole other intention than purely profit driven. But I would prefer not to neglect the opportunity to sustain our activities with a competitive market realism. Of course I know better than anyone else that clothing production in the development of the global economy, has often degenerated into a system of exploitation. But that was not always the case and today, it is still not necessarily the fate of the average worker in this sector. My challenge is to align the production and the market strategy and to work towards economic sustainability in the longer term. I hope to be able to contribute with Lyn in strategy and creativity as well. I will undoubtedly learn as much from all of you as I feel that I can now use my knowledge in the right place. There is a lot of work to be done but there are many socio-economic developments that indicate that for the future and with our mutual efforts, we have the wind in our sails. So, here our match with Solid Clean Clothing and Crafts. Thank you very much Lyn, for setting up a magic enterprise. It is a great idea that comes straight from the heart and it took tremendous patience and dedication. I am very honoured that I was chosen for this challenge and honestly, I find it a golden opportunity in my personal and professional life. Do you also like to take the initiative? Do you, like Solid, also want to start something sustainable in crafts, lifestyle, fashion, deco? Belgium appears to be full of committed people who want to roll up their sleeves. Nice! A lot of questions about this are currently going to Lyn, general manager and initiator of Solid vzw, who liked to respond to this. So we thought: why not make an interesting questions-happening? Once every 2 months there will be: Solid Crafts Inspirational Session. The next one is March 15th 4.30 pm – 6.30 pm. And you take the answers home! All of this for free! Maybe you can support the initiatives of Solid in return. Your voluntary contributions to our fair workshops can be done on the account number 523-0808634-20 with notification ‘Support Solid Inspirational – crafts’. APPOINTMENT AT THE OFFICES OF SOLID VZW, KORTRIJKSESTEENWEG 697, 9000 GENT ON FRIDAY MARCH 15 FROM 4.30 PM - 6.30 PM. Please contact Inge to confirm your attendance: inge@solidinternational.be - 0032 473 93 76 19. And please forward us your approach and most important questions. This way Lyn can prepare herself even more carefully. Have a look behind the scenes here at Hadithi in Kenya. Have a look behind the scenes here at Hadithi in Kenya. Piece by piece, these baskets are made by the most amazing women, who work at their own pace and time so they not only have their own income, but also time left to spend with their family. Each basket is unique and carries the signature of the weaver. 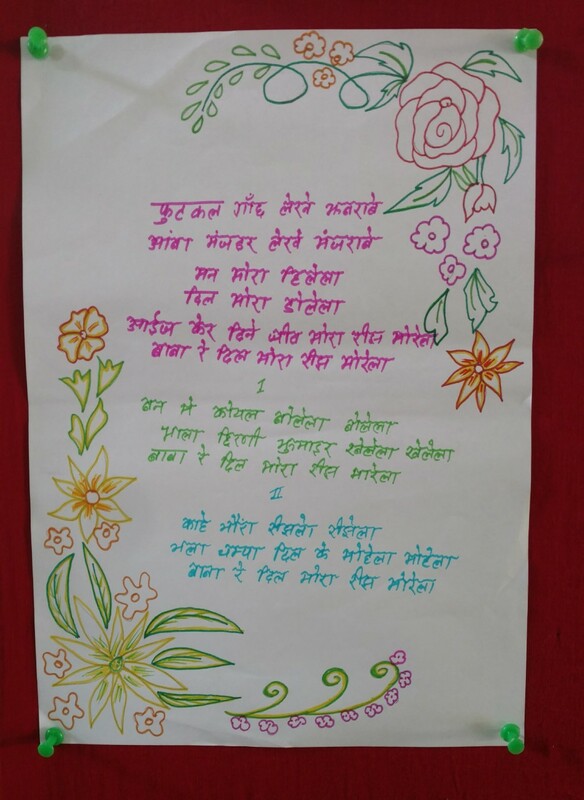 Very recently, Caro from Jyoti – fair works visited the workshop of Solid in Rampur, India being Paces Crafts. Jyoti – fair works is a fashion brand that produces beautiful, timeless and sustainable clothes with our handloom fabrics. Jyoti wants to make sure that everybody across the supply chain can live on what they earn. Moreover, it is their top priority to minimise the environmental impacts of textile production. We from Solid Crafts strongly identify with their mission and are very proud to be part of their inspiring story. One of our Indian weavers asked her why she chose to work with our workshop Paces Crafts. Caro answered that they are very satisfied with the quality of our fabrics. People often think that they are made from silk because they are so soft. But actually they are made from organic cotton. 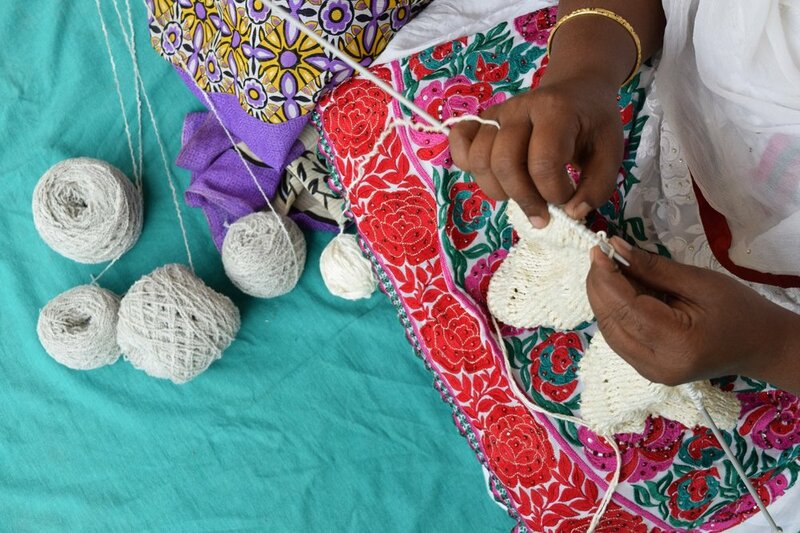 The eyes of our artisans were sparkling with pride when they heard the compliments on the quality of their work. Thank you for visiting us Caro, it was a pleasure to have you here. Always welcome to visit again the Solid family at India with our Paces Crafts workshop! January has been designated as National slavery and Human trafficking prevention month. In Jharkhand, where the Indian Solid workshop ‘Paces Crafts’ is situated, thousands of girls and women are trafficked each year. Since these girls and women don’t see a future for themselves in the village, they don’t see another way out and believe the traffickers when they promise them an education and job in the city. With Solid we believe that by offering a decent job in the remote villages these women will less probably emigrate to the big cities in search of a better destiny where they often end up in situations of abuse or extreme poverty. By paying them fair wages and empowering them economically and socially, Solid and Paces Crafts aim to enable future generations the chance for improved education and livelihood. My name is Irma and I am 23 years old. I am a single mom and I live with my grandfather and grandmother. My 8-year-old son is in the third grade of primary school. To earn something I do embroidery. They pay me a small wage as the work progresses. My mother left me with my grandparents when I was a baby. I still don’t know why. It still hurts a lot. I would’ve loved to grow up with my mother because I really needed her when I was a young adolescent. Because of that lack, I feel a lot of resentment in me and because of that I treat my son wrong in my turn. I shout at him and sometimes hit him too. When Yovana from Solid Peru came to my village and visited me for the first time, she said that we would work it out together to ensure that we can live well and happy. And I thought: “How will that be?”. She asked me how I wanted to see my son in 15 years if I continued like that. I had never thought of the future of my child! She also asked me about my childhood and made me realize that I should not have grudge. She was going to help me get over it bit by bit so that I could live quietly. Thanks to the visit and the conversation with the Solid coach I felt much better. Yovana from Solid visits me every month and every time I learn something new. Today I learned to recognize my emotions and what I can do to not feel bad. Or to ensure that other would not feel bad. During her visit this month, she taught me how to raise my son with kindness and steadfastness. I now understand that I caused him a lot of damage by shouting at him and sometimes hitting him. And that while I thought I corrected him in a good way! Before I cooked on an open fire. Yovana from Solid, however, explained to us that the smoke is harmful to the lungs and eyes. When I realized that, I started to improve my kitchen. I dreamed of a different kitchen and now I have one. My grandfather helped me with the work. My new kitchen does not smoke and it uses less wood. In order to be able to pay it, my grandparents and I have put together some money and we can pay Solid in two installments. A cupboard is still missing, but it still needs to be painted. My grandparents, my son and I are very happy with it. So in the end, everything went well anyway! Ik heet Irma en ben 23 jaar. Ik ben een alleenstaande mama en woon samen met mijn grootvader en grootmoeder. Mijn zoontje van 8 zit in het derde jaar van de basisschool. Om iets te verdienen doe ik boorduurwerk. Ze betalen mij een klein loon naargelang het werk vordert. Mijn moeder heeft mij bij mijn grootouders achtergelaten toen ik nog een baby was. Ik weet nog altijd niet waarom. Dat doet nog steeds veel pijn. Ik was zo graag bij mijn moeder opgegroeid want ik had haar erg nodig toen ik een jonge adolescent was. Door dat gemis voel ik veel wrok in mij en daardoor behandel ik mijn zoon op mijn beurt helemaal verkeerd. Ik roep tegen hem en sla hem soms ook. Ze vroeg me hoe ik mijn zoon wilde zien over 15 jaar als ik zo voort deed. Ik had nog nooit aan de toekomst van mijn kind gedacht! Ze vroeg me ook naar mijn jeugd en deed me inzien dat ik geen rancune moet hebben. Ze ging me helpen om er beetje bij beetje over te geraken zodat ik rustig verder kon leven. Door het bezoek en het gesprek met de coach van Solid voelde ik mij al veel beter. Yovana van Solid bezoekt mij elke maand en telkens leer ik iets anders. Vandaag leerde ik mijn emoties te herkennen en wat ik kan doen om me niet slecht te voelen. Of ervoor te zorgen dat anderen zich niet slecht zouden voelen. Tijdens haar bezoek deze maand, heeft ze me geleerd hoe ik mijn zoon kan opvoeden met vriendelijkheid en standvastigheid. Ik begrijp nu dat ik hem veel schade toebracht door te roepen en hem soms te slaan. En dàt terwijl ik dacht dat ik hem op een goede manier corrigeerde! Voordien kookte ik op een open vuur. Yovana van Solid legde ons echter uit dat de rook schadelijk is voor de longen en de ogen. Toen ik dat besefte begon ik mijn keuken te verbeteren. Ik droomde van een andere keuken en nu heb ik er een. Mijn grootvader heeft me geholpen bij de werken. Mijn nieuwe keuken rookt niet en ze verbruikt weinig hout. Om ze te kunnen betalen hebben mijn grootouders en ik samengelegd en we mogen van Solid betalen in twee termijnen. Er ontbreekt nog juist een kast, maar die moet nog geverfd worden. Mijn grootouders, mijn zoon en ikzelf zijn er ontzettend blij mee. ‘My name is Joel Asto Prado and I live in Munaypata, a little town in the mountains of Ayacucho, Peru, with my parents. My dad has been working in Pisco since this year. He only comes home every 3 months. So I stay behind with my mom. My mom is fully devoted to our cows to earn some money. I am going to high school in Allpachaka. In March of this year Rosa and José from Solid visited our school to talk about the Jovem training. We had a very interesting workshop with them. We were able to nominate ourselves for the Jovem training. Solid and Jovem believe it is important that our parents support the training and support their children. Because my parents could not be present, I was not selected and therefore I was very sad. I knew they were strict at Jovem. If you do not show up without a valid reason, you cannot continue the program. My classmates knew how much I wanted to join and told me that someone had been expelled for this reason. So I immediately called Rosa and José and asked them if I could join the training. I was very glad they accepted me. I went home with great joy and discussed it with my parents. They supported me. I learned so much in the Jovem training this year. 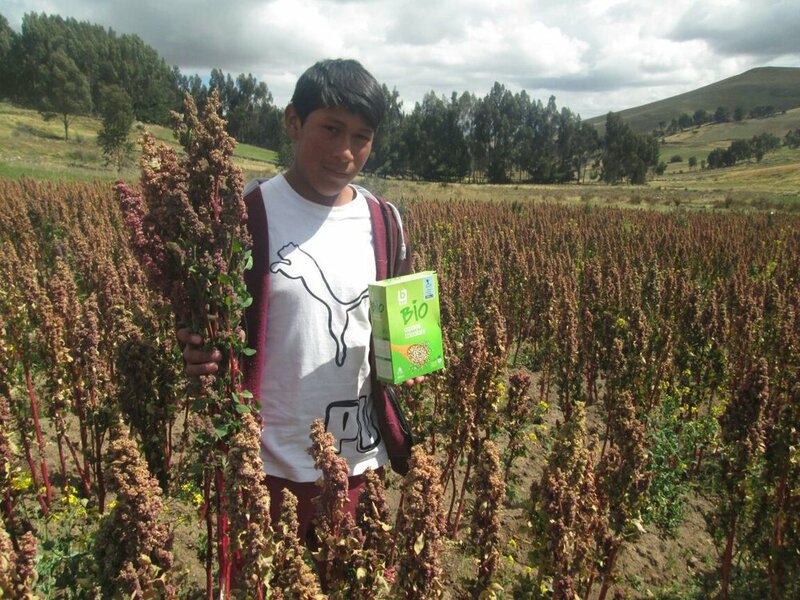 About agriculture, crops, quinoa, livestock, animals and about entrepreneurship and business. But also about myself. And I think that is equally important and valuable. It helps me a lot to develop myself as a person, to learn to appreciate myself, to build my confidence, to set goals for myself and to try to achieve them. Ik ben Joel Asto Prado en woon in Munaypata, een dorpje in de bergen van Ayacucho, Peru met mijn ouders. Mijn papa werkt sinds dit jaar in Pisco. Hij komt maar om de 3 maanden thuis. Ik blijf dus achter met mijn mama. Mijn mama wijdt zich volledig aan onze koeien om zo wat centjes te verdienen. Zelf ga ik naar de middelbare school in Allpachaka. In maart van dit jaar bezochten Rosa en José van Solid van de Jovem-opleiding onze school. We hadden een super interessante workshop met hen. . We konden ons kandidaat stellen voor de Jovem opleiding. Solid en Jovem vinden het belangrijk dat ouders achter de opleiding staan en hun kinderen steunen. Omdat mijn ouders niet aanwezig konden zijn, werd ik niet geselecteerd en daardoor was ik super triest.. Ik wist dat ze strikt zijn bij Jovem. Als je niet komt opdagen zonder geldige reden, dan mag je het programma niet verder zetten. Mijn klasgenoten wisten hoe graag ik mee wilde doen en vertelden me dat er iemand was uitgezet om deze reden. Ik zocht dus direct Rosa en José op en vroeg me toe te laten tot de opleiding. Ik was blij dat ze ‘ja’ zeiden. Dolgelukkig ging ik naar huis en besprak het verder met mijn ouders. Ze steunden me. Ik leerde dit jaar zoveel in de Jovem-opleiding. Zowel over landbouw, gewassen, quinoa, veeteelt, dieren als over ondernemerschap en business. Maar ook over mezelf. En dat vind ik even belangrijk en waardevol. Het helpt me veel om mij als persoon te ontwikkelen, mezelf naar waarde te leren schatten, mijn zelfvertrouwen, doelen voor me te plaatsen en deze proberen te halen. Last week, it was "All India handicrafts week". During the All India handicrafts week we celebrate the development and welfare of all handicrafts artisans in India. A great opportunity to put our knitting workshop in the spotlight! With Paces Crafts - the workshop of Solid in Ranchi, India - we produce custom made designs for the global market. This interesting cross-fertilisation between international design and traditional Indian handloom techniques opens a new market for the dying craft. Our world is becoming one in which companies prioritize profits over people's dignity. Brands are taking advantage of people, most of whom are women and living in poverty, allowing employers to pay their workers less than $2 a day, in unsafe working conditions and lacking any rights that employees at regular companies take for granted. At Solids workshop in Ranchi, India - Paces Crafts - we want to show the world that doing business differently is possible. Our workers get a fair wage, work in safe working conditions and take use of the rights every human has. "I married my husband in 1979 but I've been widowed for 8 years. The basket weaving group has helped me remain more financially stable. With the money I get from selling baskets I was able to pay my children's school fees and buy them uniforms, as well as buy water tanks and solar lights for my home." When you buy Hadithi handicrafts , you are actively helping to provide an income for 850 ladies from an agricultural community in Kenia. The area where they live is a stunning and yet vulnerable ecosystem home to varied and abundant wildlife. However, semi-arid. So, harvests often fail due to a lack of rain and consequently poverty is rife. They need an income. As everybody needs. So, they often go destruct forests for charcoal, timber and farmland. And poach vulnerable wildlife present, like elephants, zebras, giraffes,…. So, buy buying the gorgeous, 100% handmade baskets you provide women like Teresia with a real alternative. You really help these women and you protect environment and wildlife. What a feel-good basket: for you, Teresia and her collegues and the wildlife! Watch a short video here to see the weaving ladies in their amazing environment with the wildlife .